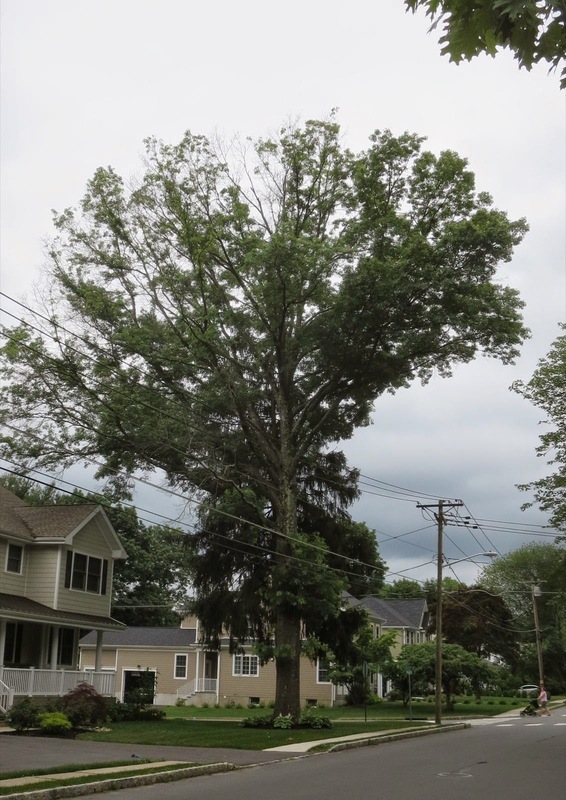 Update, July 1: Princeton's town arborist, Greg O'Neil, who was out of town when this incident occurred, reports that a permit had been granted to remove six trees, and that four additional trees (evergreens that were apparently not covered by the ordinance) were taken down. Original post: My arborist friend Bob and I were driving down Snowden yesterday, on our way to plant two native butternut trees at a local church, when we passed by this scene. 25 trees had evaporated from the front and back yards of the property. The house looks like it will meet the same fate. Did the owner have a permit to take down so many trees? Later, I heard from a fellow member of the Shade Tree Commission that two policemen and the town's lead engineer had visited the property. The owner reportedly is claiming that a permit had been applied for but not yet granted. The red marks on the stumps in the background may indicate that the stumps, being evidence, are not to be removed until the matter is settled. 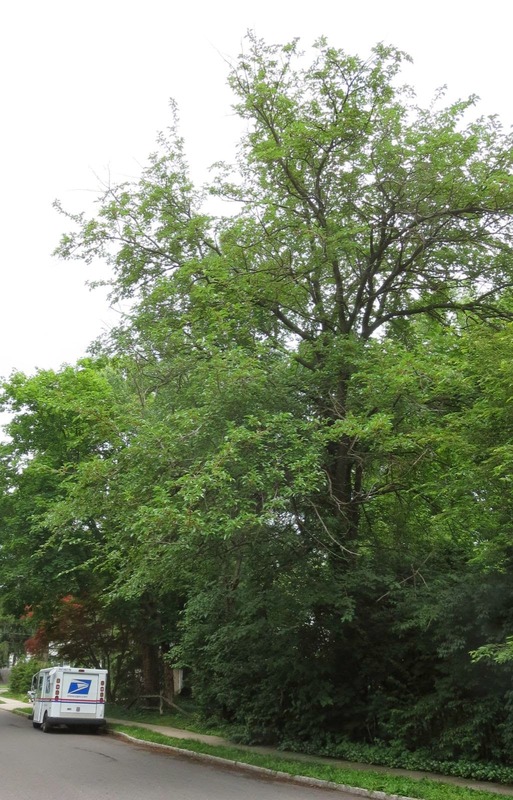 As it happens, a tree ordinance for the consolidated Princeton has just been completed by the Shade Tree Commission, and introduced with minor revisions by town council. 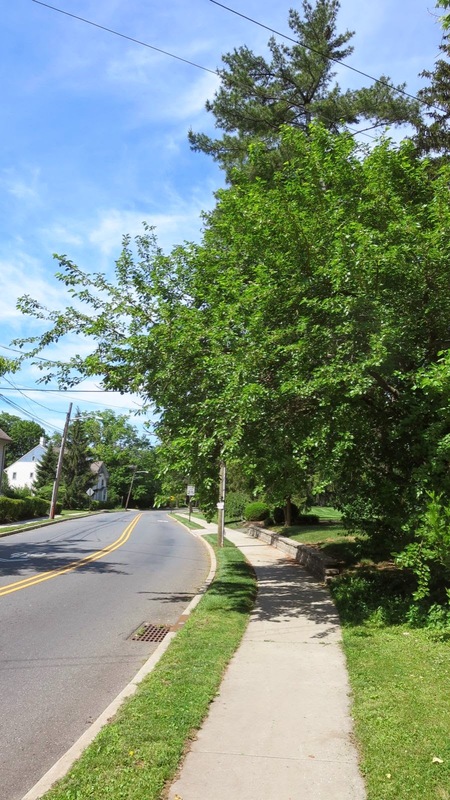 Both township and borough had tree ordinances that are still in effect. Another tree in the neighborhood came down yesterday--a 4 foot diameter pin oak in the 200 block of Hamilton Ave. The presence of a town truck at the scene suggested it was in the public right of way, even though it was on the owner's side of the sidewalk. 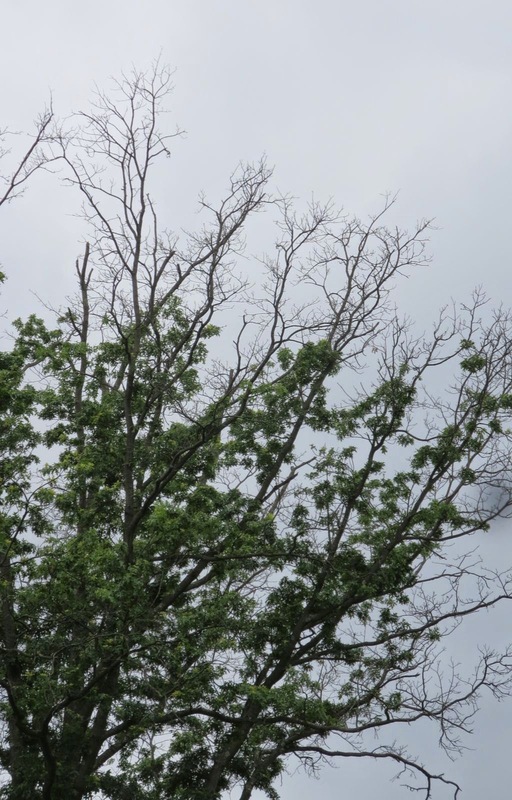 Princeton has been losing a lot of pin oaks and red oaks to bacterial leaf scorch, though the reason for this tree being lost awaits confirmation. Bacterial leaf scorch, as can be seen in this tree on Franklin Ave, expresses itself through dieback at the top of the tree. This pin oak, just across the street, though it's showing less dramatic symptoms, is still clearly thinning out at the top. Unlike many towns, Princeton has an arborist, and an excellent, devoted one at that. If you have a tree issue on your property, contact public works, either directly or through your arborist, to come up with a solution that meets your needs and the requirements of the tree ordinance. They pass us by if we don't pass by them at the right time. 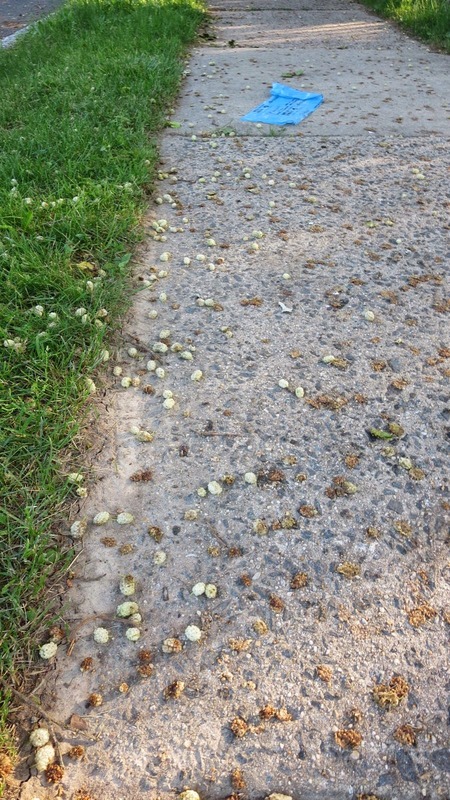 The last few days have been a very fragrant time to pass by linden trees that line streets like Bayard Lane. or along the sidewalk leading to the public swimming pool. You can even find them on Linden Lane, a street that takes its name very seriously. Look up and you'll see the two-tone, grey on green effect of the leaves. 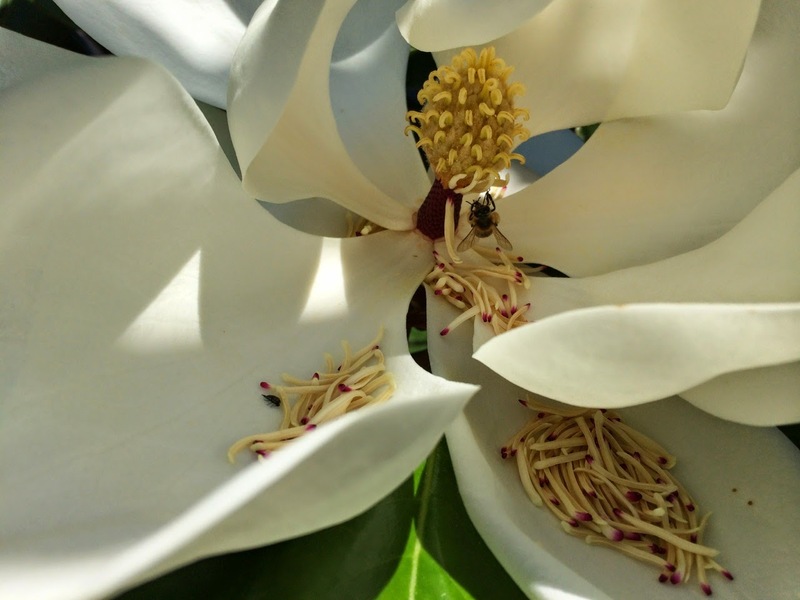 This beautiful shot of a Magnolia blossom being visited by a bee on the Princeton campus was sent to me by Karla, taken on her iPhone. The native butterflyweed (Asclepias tuberosa) is always a treat to encounter. This one's at the corner of Linden and Hawthorn. We can hope that a monarch butterfly might one day pass by and lay some eggs on the underside of this milkweed's leaves. Do you ever feel some invisible force drawing you up the trails to the boulder fields along the Princeton Ridge, whether at Herrontown Wood or Witherspoon Woods? It just might be their inherent magnetism interacting with an iPhone, binoculars, or, if you've been to the shop, one or another artificial joints. I had no idea until a neighbor approached me at the annual Memorial Day picnic at Potts Park, introduced himself as Jon Johnson, and then proceeded to tell me all sorts of interesting things about a part of the woods I thought I knew pretty well. If you take a strong magnet along (keep it away from any electronics like phones or cameras), you can test the gravel in various tributaries to see if there's magnetite in the rocks. It can vary from 2% up to 20%. Some boulders will be magnetic, too, but only portions thereof. A more elaborated post on this subject can be found at VeblenHouse.org. Knowing plants can change the way you see a town like Princeton. Students crossing this bridge over Washington Road to the new chemistry building might appreciate its form, but I doubt there's one in a thousand who would find great meaning in the tide of foliage that has finally reached parity with the railing. I, however, have been waiting with anticipation, invested with special knowledge of what that foliage bears. There, in the leaf nodes, can't you see it? Persimmons, or the beginnings thereof. By luck or the planter's intent, this persimmon is a female, which means this could be the year that we can, at last, reach through the mesh with a Chaplinesque nonchalance, and pluck ripe fruit from a persimmon tree. Anyone seen a monarch butterfly yet? You can get the latest update from "Journey North News," and even help track the monarch migration by reporting any sightings in our area. Their June 19 update says that, though the monarchs reached their north central breeding range four weeks ago, there have been no sightings of eggs as yet in the northeast U.S.. Their map shows one sighting reported in New Jersey, but it's not clear where. There's a good map here showing how important the midwest is to the survival of monarchs, and how that is also the area where Roundup-ready corn has obliterated much of the milkweed the monarchs have long depended on for raising the next generation. Keep an eye out, and consider reporting any sightings. Red mulberries ripen to black. White mulberries ripen to off-white or pink. 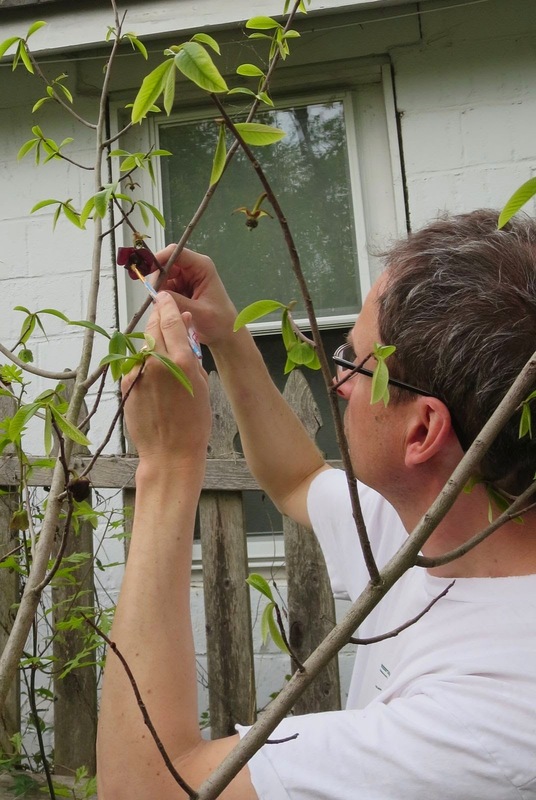 Unlike the kinds of fruits I intentionally grow--blueberries, for instance--both kinds of mulberries conveniently overwhelm the birds' appetites, leaving lots that we might eat, if we thought to pause, reach up or reach down, and eat outside the box. One strategic decision I made early on in life was not to learn everything I should have known. How wise I was, because an overabundance of knowledge would have deprived me of the pleasure of discovering things later on that should have been obvious from the get go. For instance, peonies in the garden--they're a clumsy lot, all top heavy with their blooms, not unlike our Pekin duck, which carries its cumbersome bulk with an exaggerated waddle. Only last year I finally realized that peonies are not grown to stay in the garden, but are meant to be brought indoors, where their enlivening fragrance has a chance to permeate. The same cannot be said of a duck, by the way, unless I'm in for another belated discovery in years to come. It's easy to tell white mulberry trees from red this time of year. Just look at the berries, perhaps while gorging upon them. 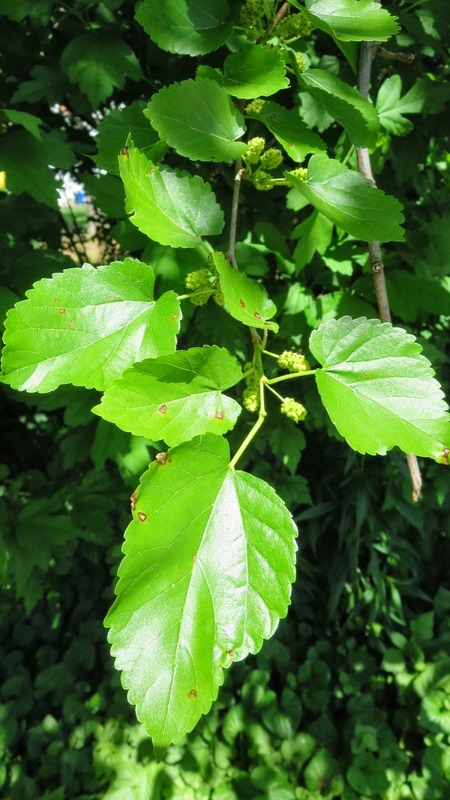 But what if a friend wants to find a young mulberry tree, before fruiting age, to dig up and plant in his yard, and prefers the native red (Morus rubra) over the introduced white (Morus alba)? This led to a bit of scouting around, both on the internet and in the neighborhood. At first, I thought I had an easy distinction. 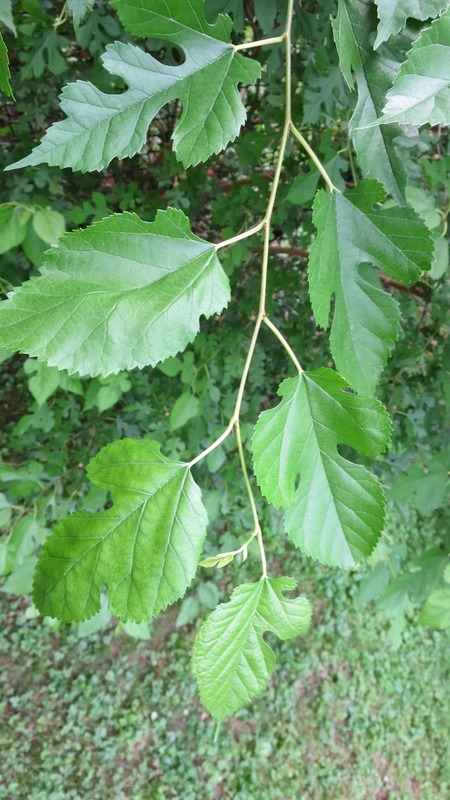 The red mulberry's leaves come in three shapes, with two lobes, one lobe, or none, just like sassafras leaves. But then my friend sent this link that shows the white mulberries have the same variation. Here you can see all three shapes on one branch of what is probably a red mulberry. while this known white mulberry's leaves appear shiny. Red mulberries can get bigger than white mulberries, and can tolerate more shade. Here's a white mulberry that's appropriately smaller than the red mulberry in the prior photo, and is thriving in full sun along Hamilton Ave. Sometimes reality conforms to expectations. In addition, you may find that the teeth running along the edge of white mulberry leaves are more rounded than those on red mulberries. Even with all of these subtle differences, natural variation and hybridization may leave any tree's identity in doubt until it bears fruit. But that's what botany is about. It sharpens the mind by forcing one to look more closely and reach for subtle distinctions. And it can even cause one to ponder the deeper issues of life, like why such a delicious berry, as with so many things nature delivers, becomes devalued due to its abundance and lack of a pricetag. Here's a fun and edible plant. 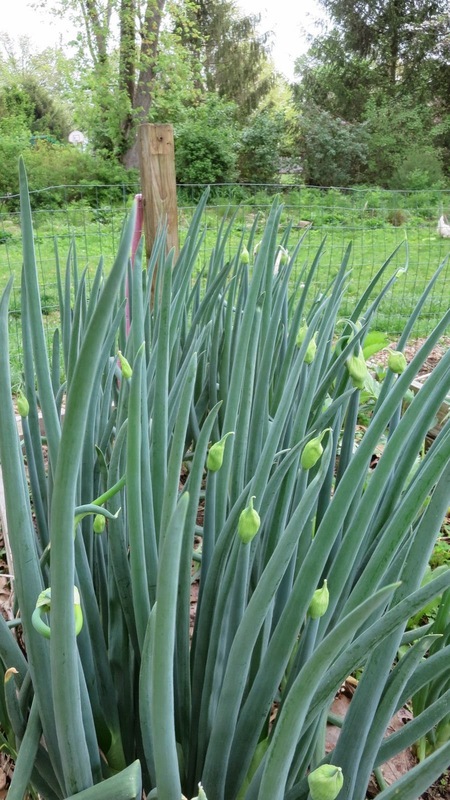 We called them Egyptian onions back in the 70s, and I acquired one for our Princeton garden a few years ago. It's a perennial that grows like a scallion in the spring, then starts forming something interesting on top. They grow new plants at their tips, sending out new leaves like slow-motion fireworks. You can see the bulbs of new plants at the tip. The weight of the new plants causes the main stem to bend over until the new plants touch the ground and take root. Thus, the term, "walking onion". The plant has its own website where you can scroll down to get more details about growing and eating. 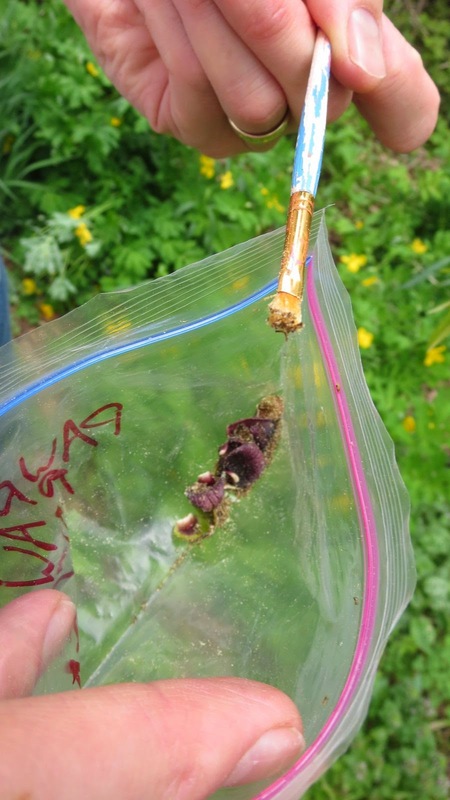 Other plants use this strategy, including a sedge called green bulrush (Scirpus atrovirens), a much less edible plant that grows in wetlands around Princeton and sprouts new plantlets at the tip of its leaves in midsummer. Round about Mother's Day, my friend Karla received this email: "Lonely apple tree seeks similar for discreet short-term relationship. Afternoons preferred." Just in case there was any misunderstanding, some explanatory text was added: "My tree is blooming, for the first time; is yours? If so, can our trees make a date? Warm regards." As it happened, her husband Steven was headed that very day to South Brunswick on a related mission, in search of pollen to satisfy the fruiting needs of another kind of fruit tree, the solitary pawpaw planted in their backyard some years ago that was now in full bloom. Though it had sprouted an additional trunk, it was still lonely, genetically speaking, and unlikely to set fruit unless visited by pollen from another pawpaw patch. Thrust into the role of pollinator, Steven found himself at a distinct disadvantage. He had neither the wings to search the greater Princeton area for other pawpaw trees, nor sufficient olfactory apparatus to detect the subtle carrion-like odor pawpaw flowers use to attract pollinating flies. And since Google Maps does not (yet) provide directions to New Jersey's pawpaw patches, the search for prospective pawpaw mates required considerable research savvy. Even upon arrival at the best prospect he could find, the orchards at Rutgers, he still required the kindness of strangers to find the pawpaws amongst all the other fruit trees in the no-doubt vast plantings at Cook College. This sort of matchmaking is becoming more common as the local food movement, perhaps abetted by backyards made sunnier by tree-toppling storms in recent years, prompts the planting of solitary fruit trees in cloistered backyards--peaches, apples, cherries, figs, persimmons, pears, and the occasional pawpaw--all with uncertain prospects for leading a healthy, promiscuous life of cross-pollination. For those who know pawpaws only from the childhood lyric about a "pawpaw patch", they happen to be a native understory tree in the Annonaceae--a family of mostly tropical species. One relative of pawpaw grown by the Incas is touted as perhaps "the greatest fruit on the planet", with a taste combining mango and banana. Pawpaw, adapted to the north, offers a chance to grow tropical tastes in cold climes. Though delicious, its shelflife is short, which has thus far limited the pawpaw's commercial potential. Thanks to the internet, I now know that the "way down yonder in the pawpaw patch" phrase that I've been carrying around in memory all these years comes from a boyscout song. I did not personally reach the status of boyscout, having earned my bobcat, wolf and bear badges in cubscouts only to lose momentum during a leadership void in that critical transition from cub to boyscout. The transition is called webelos, which stands for "we'll be loyal" scouts, a molting process that not everyone successfully completes. If I had, I might have learned the complete lyrics for Pawpaw Patch, and known that "way down yonder in the pawpaw patch" answers the musical question "Where oh where oh where is Susie?" It matters where Susie is because she happens to be the "queen of Hawaii", which goes with the pawpaw's tropical family roots. If you ever go to Hawaii, you may encounter some of pawpaw's relatives, like the ylang ylang, soursop, and sugar apple. However, according to the song, you needn't go way down to Hawaii, because Susie will teach you to hulu way down yonder in the nearest pawpaw patch. If not completely distracted by Susie's hulu tutorials, the astute boyscout will note that "way down" and "patch" are descriptively correct, because the pawpaw tends to grow in rich bottomlands, and forms clones from its spreading roots. There's another lingering pawpaw-related mystery knocking around in my memories. In my parents' Michigan backyard in the pre-internet 70s, a pawpaw sprang up spontaneously one year, grew into a patchlet of several stems, and after a few years began bearing flowers and a few fruit the size of a small mango. Where the pawpaw came from is a mystery, as was its capacity to bear fruit, because there was no known patch nearby, and the seeds looked much too large to navigate a bird's digestive tract. We didn't ask questions, however, because they were delicious. A bit of pollination assist with a cue tip may have helped with yield one year, which the raccoons and squirrels were grateful for. Steven's recent research, empowered by the internet era, has delved far more deeply into the sexuality of a pawpaw. Way up yonder in this pawpaw post is a picture that Steven sent me of two pawpaw flowers, the green one not yet having acquired that lovely burgundy hue that flies are supposed to mistake for dead meat. If a pawpaw flower were able to speak to its sexuality, it would say something like "I was female before I was male." Here to the left is a male flower, which is really a female flower a few days later. Looking closely, you can see a subtle difference. There are now yellow (male) anthers surrounding the green dot in the center (female stigma). The logic is that the anthers on any particular flower open up as the stigma is closing down, thereby preventing a flower from pollinating itself. But that logic suggests that a tree with flowers in different phases could in fact pollinate itself, with pollen from one flower spreading to the next, and make fruit without importing pollen from elsewhere. Still, the available information suggests that it helps to have cross pollination from one pawpaw patch to another, and that human-assisted pollination is often needed to make up for a lack of interest among the local flies. Next year, Steven won't have to travel to South Brunswick in search of a "house of reputed pawpaws", because by chance I found a fine potential mate in the backyard of another friend, behind the Jewish center just a quarter mile away. It's a splendid specimen, thirty feet high, sporting perhaps a thousand flowers. But pawpaw growers shouldn't have to depend on chance discovery. There needs to be an internet dating service for fruit trees. Sometimes it takes a village, or at least a good network. Update, June 9: Just met a neighbor named Joe who has replaced the lawn in his side yard with four varieties of pawpaw and a lot of mulch. 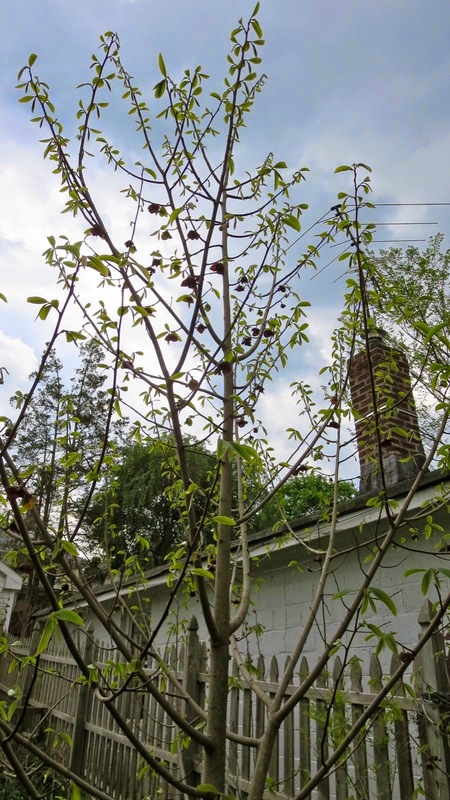 He says that wild pawpaws are common in Maryland, that raccoons and squirrels may be repelled by the bad-tasting skin of the fruit, and that it's easy to emerge from wild pawpaw patch with large buckets of fruit. I did not ask about any encounters with Susie, or if Marylanders are more adept at doing the hulu. It's almost like someone chose to plant horse chestnuts in front of Princeton's Monument Hall knowing that their blooms would coincide with Memorial Day ceremonies. Here, while taps is being played, one of the first African American marines, Wallace C. Holland, Jr, salutes, and fellow veteran and guest speaker Elana Duffy (under the bell of the horn) looks on. Meanwhile, elsewhere in Princeton, in front of a home where Thomas Jefferson reportedly stayed when Princeton was briefly the nation's capital, another horse chestnut has less in the way of freedom to celebrate. The blue flowers are of a wisteria vine that's been steadily consolidating its claim to the tree's infrastructure. 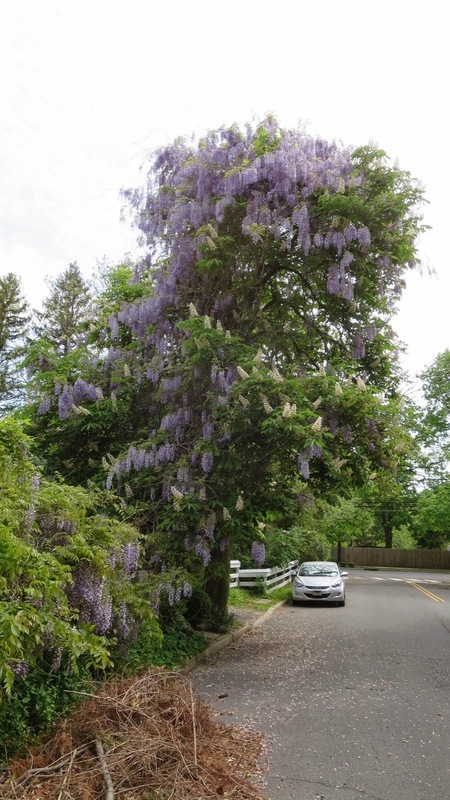 From a distance, the scene looks like this, with the wisteria each year adding weight while reducing the tree's access to solar energy to maintain its strength. The effect is pretty, but we'll see how long the tree can take it. Unlike the American colonies, the tree has no way to free itself of oppression. 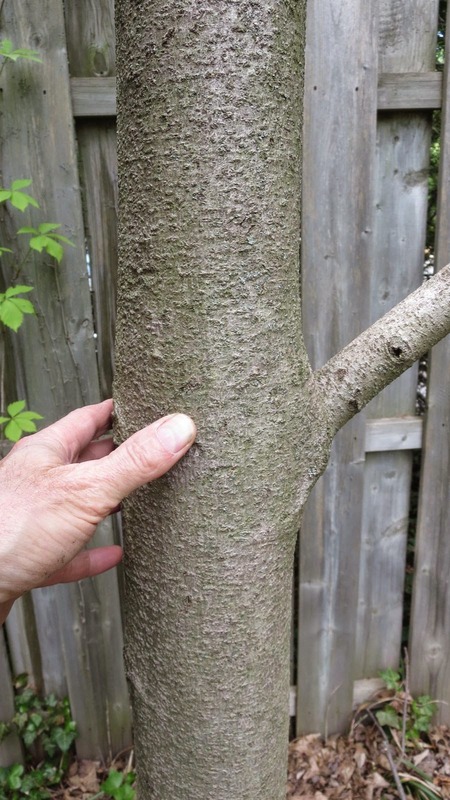 Having first encountered fringe tree in North Carolina, I wondered if one I bought at a nearby nursery would make it through our deeper than usual New Jersey winter. They take their time showing signs of life in the spring, but this one finally burst forth with leaves and lacy white flowers. In time, it will reach the size of a large lilac or small flowering dogwood. 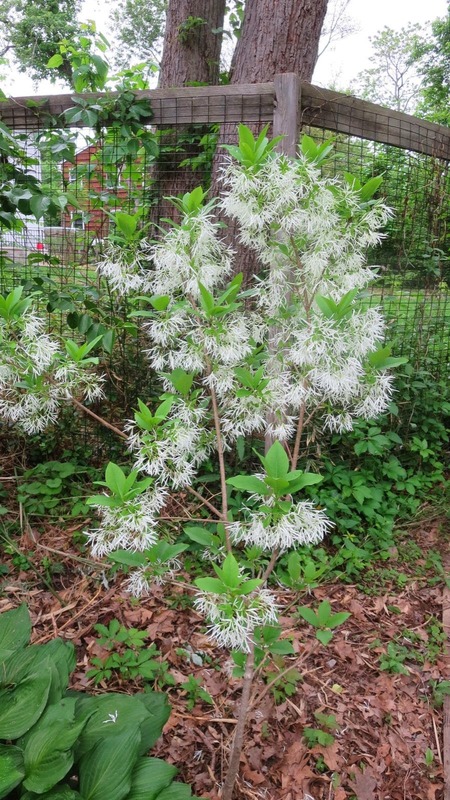 but the fringe tree is down at the right level, blooming at the right time. It's dioecious, meaning "two houses", meaning there are male and female plants. The males are said to be somewhat showier. Here's a link for some medicinal aspects. 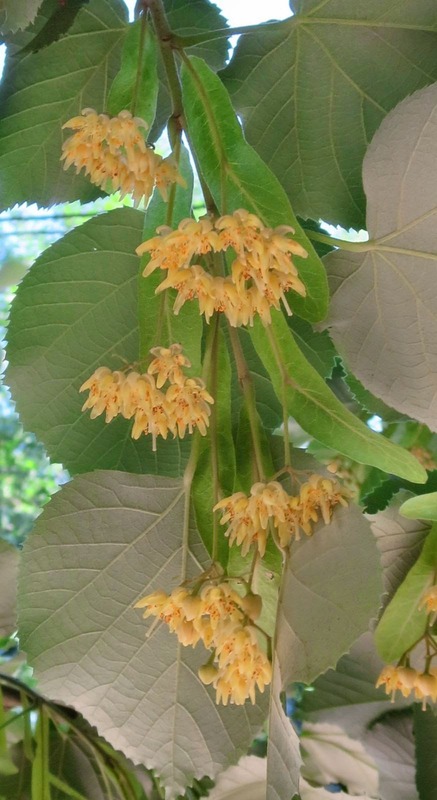 I've encountered fringetree only once in the wild, which is one time more than some other natives in the horticulture trade, such as oak-leafed hydrangia, bottlebrush buckeye, or purple coneflower. The wild fringe trees were on a north-facing slope in North Carolina, with soils influenced by diabase rock similar to what we find on the Princeton Ridge. Being less exposed to direct sun, soils on a north-facing slope are cooler and slower to dry out. 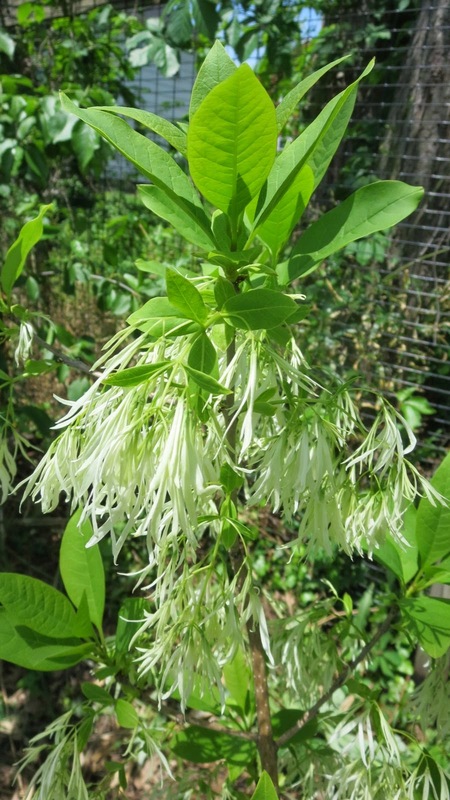 One approach to gardening with mostly natives is to learn what species a plant like fringe-tree is likely to be found with in the wild, then bring some of those species together in the yard. It can be satisfying to have a plant growing in the context of its natural associations, as art museums do when they display a painting not in isolation but in the cultural context within which it was created. 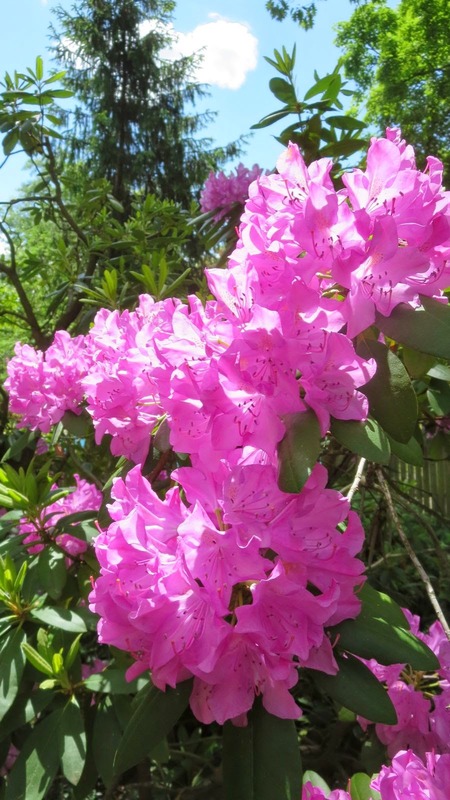 Or, one can think more in terms of color and timing, using the fringe tree as well-timed pink relief in a neighborhood dotted with Rhododendrons. The Trenton Times ran a front page article today, Sunday, on the Veblen House and the Rogers House--another county-owned historic building that has fallen into disrepair. (It's early morning, and I first wrote "fallen into repair". Wouldn't that be nice.) 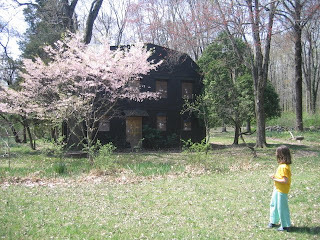 Veblen House is part of Herrontown Woods, the first 95 acres of which were donated by the visionary mathematician Oswald Veblen and his wife Elizabeth to Mercer County. They intended the house to be given a public use, but the county rented it out until 1998, then boarded it up. The Trenton Times article brings much-needed attention to the issue of saving government-owned historic buildings. Those that fall off a government's priority list tend to be left unprotected, even when a low-cost intervention like patching a small hole in a roof would add many years to their longevity. Fortunately, the Veblen House has a metal roof that has kept it protected through these many years. 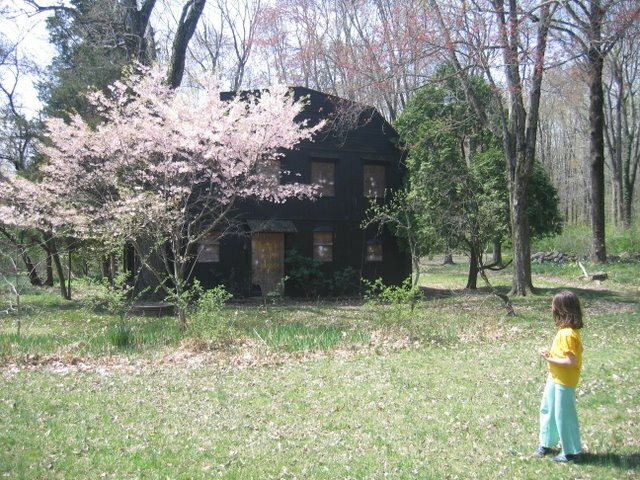 The online version of the Trenton Times includes a series of twelve photographs of the house and cottage. For years, there's been an ongoing confusion about which house is which, so I've added a post entitled "Will the real Veblen House please stand up". Though the Veblen House doesn't look like much from outside, it's a fascinating, one-of-a-kind house, given added dimension by its peaceful wooded setting on the edge of the preserve, and the extraordinary career of Oswald Veblen. News about work on trails and habitat at Herrontown Wood can be found at https://www.facebook.com/FriendsOfHerrontownWoods. Work on putting a nonprofit together to rehab the house and cottage is coming along, and the Rotary Club of Princeton has been holding monthly workday Saturdays at the Veblen House grounds.